I remember the first time that I saw a hedgehog. I was studying abroad in England, returning home after a night out, and outside my flat I heard a snuffling sound in the underbrush. Seconds later, a small hedgehog toddled out, seemingly unfazed by our presence. This small moment has stayed with me. I feel that Hugh Warwick, the author of The Hedgehog's Dilemma, would appreciate my story of my first encounter with a hedgehog considering his overwhelming passion for the personable little creature. 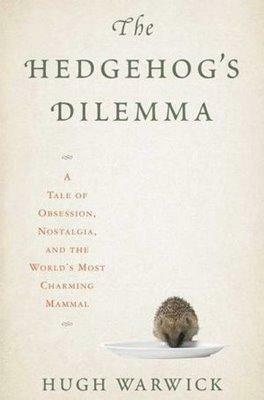 Warwick has been researching hedgehogs for over twenty years, and his story is a mix of biography, scientific research, and impassioned plea. Warwick tells his own story of researching hedgehogs across the years and across the seas, and we are met with a number of characters. There are the hedgehog collectors in America, where no native population exists. There are the overzealous journalists blaming hedgehogs for the decline of bird populations in Orkney. There are the incredibly selfless caretakers of injured or abandoned hedgehogs. Warwick ends up in China looking for the elusive (possibly extinct) hughi hedgehog, his namesake hedgehog in a way. He tracks this specific species of hedgehog from the museums to the forests of China. I felt the excitement and possibility of the moment as he crossed continents in search of hughi, and you’ll have to read the book yourself to see what happens. Hedgehogs—little creatures that trundle through the underbrush of England and other parts of Europe—are being threatened by human interference. With the demolition of the famous English hedges that hedgehogs are so inherently fond of, combined with the more cars on the road, the hedgehog population is diminishing. Inherent in this book—other than a clear love song to the hedgehog—is the message that humans are negatively affecting their environment. A conscious effort must be made to first acknowledge this fact, and then, something must be done about it. This is awesome. I love hedgehogs!